Michael McFadyen's Scuba Diving - Isle of Pines Already inhabited for many thousands of years by the Kunie people, the Isle of Pines was "discovered" and named by James Cook, RN, in early September 1774 on his second circumnavigation of the globe. Named for its 60 metre high pine trees, the Isle of Pines is very unlike any other South Pacific island I have ever visited. Measuring 18 by 14 kilometres and lying 140 kilometres south-east of New Caledonia's capital, Noumea, the island itself is not very tropical and is almost dry in parts. Air Caledonie flies there three times a day and the 25 minute flight is in a very comfortable Aerospatiale AZ42 propjet. Driving from the airport to our resort I could have believed that we were in coastal New South Wales rather than on a South Pacific island. A low heath like vegetation with the occasional melaleuca and bracken reminds me of home. Our resort, Gite Kodjeue, is clean and tidy, if somewhat simple. Only metres from the beach (see photo at left), our apartment is one of six small but comfortable apartments in a group. Hot showers and toilet are off the main room with its two beds. There are also nine larger bungalows. Nauticlub Diving, established in 1969 by Tony Klotz, a former Swiss banker, is located in the resort. Renamed Kunie Scuba Centre on 1 January 1994, the operation recently moved into new premises in the resort and is very well set up with excellent washing and storage facilities. The dive boat leaves from the front of the resort. Tony has just ordered a new 11 metre Cougar Cat from Queensland and two new compressors. There are 40 tanks (mostly steel) and 15 full sets of gear. You should check your tank before leaving the beach as some regs (eg Sea Hornet) will not fit over the valves of some of the tanks. You will normally arrive early in the morning from Noumea and after unpacking, walk down to the boat where tanks and weight belts are already aboard. It is a 15 minute trip to Gadji Reef off the north-western corner of the island where our first dive, Gorgonia Valley, is a shear wall dropping from 10 metres down to more than 35 metres. As well as some swim-throughs, nice coral and fairly abundant fishlife, a black-tipped reef shark darts in, pectoral fins pulled in close, in a frantic dash. It darts here and there, defending its territory for a few minutes before leaving our view. Upon surfacing, Tony informs us that this shark has lived here for eight years, acting this way each time he visits. For our surface interval we have lunch on nearby Oupere Island. What a meal! Raw fish, crayfish, trigger fish, salads, French bread and we are all stuffed. After a good surface interval, our next dive is the Oupere Grotto. This site, only a few hundred metres from the island, consists of a myriad of caves, tunnels and arches. Led by Phillip Scheidt, Tony's Operation Manager, you soon have no idea where you are as you go through tunnel after tunnel. Some are tight squeezes, others very big, but all exciting. Some spectacular photo opportunities exist, just take your pick. The depth goes from five metres on the top of the reef down to more than 30 metres. A smooth trip back in Tony's purpose built 7 metre timber dive boat completes a great day's diving. The next morning sees us climbing aboard a mini-bus with Phillip for the short drive to some limestone caves. 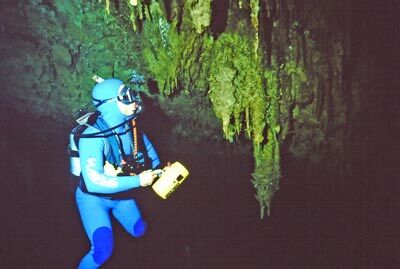 I have dived limestone caves before in Palau, but they were salt-water. The Devils Grotto is land locked and the water is nominally fresh (actually saline). The bus stops at the end of a rough road and we walk the 75 metres to the cave. A relatively hard climb down the cave's entrance brings you to a pool. You enter the water and drop down, squeezing between a series of stalactites and stalagmites along a passage. This opens into a large cavern, with "chandeliers" hanging from the roof. The water is like crystal clear gin. The other divers seem to be suspended in mid-air, their powerful torches lighting up only a small section of the whole cave. We pass into another part of the system, an even bigger room. Simply amazing. A tiny shaft of light enters through a hole high in the roof, providing a fascinating contrast to the darkness. Eventually we retrace our steps to the outside. Maximum depth was only 6 metres, but a unique dive for someone from Sydney. Other resorts on the Isle of Pines include Nautiwatch. This a bit more up market than Kodjeue, but it means a 20 minute bus trip at extra cost to get to Tony's dive operation. If you had a non-diving spouse and children, I would suggest Nautiwatch as being more suitable. 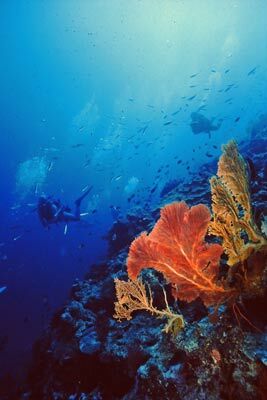 There are quite a few things to do on the Isle of Pines apart from diving. 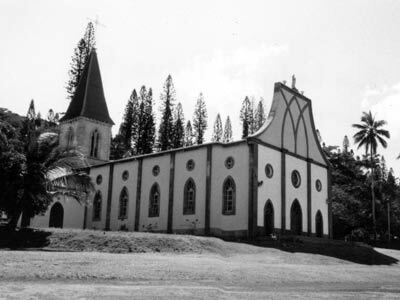 These include a tour of the island to see the beautiful Our Lady of Assumption Church at Vao, dedicated on 24 September 1887 and the Sacred Heart of Jesus statue (with traditional carvings) in St Maurice Bay where the Marist Missionaries arrived on 12 August 1848. Another fascinating feature is the Grotte d'oumagne. This huge limestone cave has a small stream running through it and about 150 metres inside it opens up into a huge hole through to the sky. 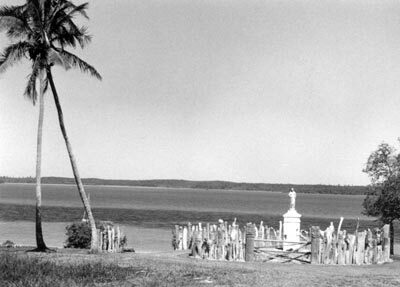 In 1855/6, Queen Hortense hid here during a fierce tribal war and at the entrance is a small representation of Our Lady of Lourdes. Like all of New Caledonia, the Isle of Pines is expensive, with beers 350 cpf ($5.40), soft drinks 180 cpf ($2.75), snacks 350 cpf ($5.40) and a simple three course meal 1700 cpf ($26). Unfortunately, there are no alternatives to the resort restaurants so you will need to eat and drink wisely or be rich. Prices are when I visited in October 1993. The water temperature in October was 23 to 24° (22° in cave) and a 3mm steamer needed. It is too cool for a lycra suit but a short wetsuit is okay if you are hardy. The temperature varies from 21° up to 25° in late summer. Visibility on each of the ocean dives was excellent and ultra-excellent in the cave. The winds tend to blow a bit in the evening, so a long sleeve t-shirt or two would be worth taking as well as a sloppy joe in winter. All in all, an excellent dive location, only let down by the cost of food and drink and the lack of alternatives to your resort's restaurant.